CAPE CANAVERAL, Fla. – The final landing of space shuttle Discovery in Florida today (March 9) before the spacecraft retires is not the only an ending for NASA's shuttle program. 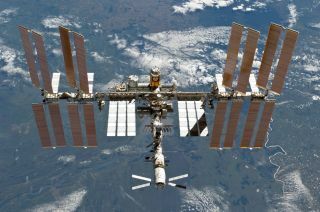 The mission also delivered the final American piece of the multinational puzzle that is the International Space Station. "The shuttle left us in great shape," said Kenneth Todd, NASA's space station mission integration and operations manager. "It was definitely bittersweet to see Discovery leave. She's done just a flawless mission for us in support of the program, and as she was backing away, it was clear that was the last time she's going to visit us." Discovery, NASA's most-flown space shuttle, is returning to Earth to end its last mission, STS-133, as NASA winds down its 30-year-old space shuttle program. Only two more shuttle missions are planned, but neither will deliver a new U.S. room for the space station like Discovery did with its final flight. The International Space Station is the largest structure ever built by humans in space. From end to end, its exterior structure is as long as a football field and it can easily be seen from the ground with the unaided eye if you know where to look and have good weather. Construction of the $100 billion space station has been ongoing since the first piece, a Russian module, launched in 1998. Today, the station is the result of work by 15 different countries and five space agencies. It has a crew of six astronauts who live in a network of connected rooms, which gives them a total living space of a five-bedroom home (or a Boeing 747 jumbo jet), NASA officials have said. Discovery's six astronauts used the station's robotic arm to attach the room on the bottom, Earth-facing side of the station's Unity node on March 1. The PMM is NASA's final contribution to the assembly of the space station, so construction on the orbiting laboratory– at least on the American side – is now complete. It was originally built for NASA by Italy's space agency to serve as a temporary cargo pod, named Leonardo, for delivery missions. With more space on the station needed, NASA refitted the cargo module for a permanent stay in space. "If you look at strictly the USOS (U.S. Operating System), we've essentially completed what we have today in terms of our plans," Todd said. "There's nothing else in our plan that gives us additional volume that we're working on right now." There are, however, some additional components that will be added to the space station between now and the end of NASA's space shuttle program later this year. For instance, an external storage shelf is set to travel to the station on Endeavour's STS-134 mission, which is scheduled to launch on April 19. On its final mission, Endeavour will also be carrying a $1.5 billion astrophysics experiment, called the Alpha Magnetic Spectrometer to the International Space Station. The 15,000-pound (6,800-kilogram) cosmic ray detector, which is set to be installed on the station's truss, will search the cosmos for antimatter galaxies and elusive dark matter. The shuttle Atlantis is slated to fly in late June carrying more supplies and spare parts to the station. Elsewhere on the station, another Russian module is expected to be added by Russia's Federal Space Agency in the next few years, but construction from a U.S. standpoint is now 100 percent complete, Todd said. NASA's remaining two shuttle missions are also aimed at helping to posture the station for the years ahead, when the agency will no longer have the enormous cargo-carrying capability of its shuttle fleet.